This may surprise you. We’ve learned that time (between neck-sizing operation and bullet seating) can have dramatic effects on neck tension. 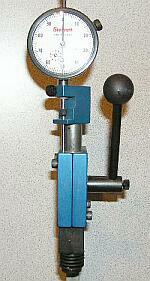 Controlling neck tension on your cases is a very, very important element of precision reloading. When neck tension is very uniform across all your brass, you’ll see dramatic improvements in ES and SD, and your groups will shrink. Typically you’ll also see fewer fliers. Right now, most reloaders attempt to control neck tension by using different sized neck bushings. This does, indeed, affect how firmly the neck grips your bullets. But time of loading is another key variable. James Phillips discovered that time is a critical factor in neck tension. James loaded two sets of 22 Dasher brass. Each had been sized with the SAME bushing, however the first group was sized two weeks before loading, whereas the second group was neck-sized just the day before. James noticed immediately that the bullet seating effort was not the same for both sets of cases — not even close. Using a K&M Arbor press equipped with the optional Bullet-Seating Force Gauge, James determined that over twice as much force was required to seat the bullets which had been neck-sized two weeks before. The dial read-out of seating force for the “older” cases was in the 60s, while the seating force for the recently-neck-sized cases was in the 20s. (These numbers correspond to pounds of force applied to the bullet). Conclusion? In the two weeks that had elapsed since neck-sizing, the necks continued to get tighter and stiffen. Lesson learned: For match rounds, size ALL your cases at the same time. If you want to reduce neck tension, load immediately after sizing. Share the post "TECH TIP–Neck Tension vs. Time"
Mike Ratigan, author of the definitive print guide to benchrest shooting, Extreme Rifle Accuracy, knows the importance of a smooth-tracking stock. A gun that recoils more consistently is easier to shoot accurately. Reducing friction on the fore-end and toe of your riflestock can help the gun track better in the bags. The easiest way to reduce friction is to apply stock tape. Ratigan says the best stuff he’s tried is clear 3M-brand Teflon® tape. According to Mike it adheres well, lasts a long time, and reduces friction “as well as anything you can buy”. Mike reports “You won’t wear this stuff out–it’s basically a permanent fixture”. The tape is sold by Ron Hoehn, Hoehn Sales, Inc., (636) 745-8144. Ron’s 5-mil thick Teflon tape kit ($7.00) is enough for two rifles, with 5″x5″ sections for the front and 2.5″x6″ panels for the rear. You can purchase a Teflon stock tape kit from Sinclair Int’l for $12.50. This has four 5″x5″ segments, enough for two rifles. But if you have a large collection of rifles, you’ll save big bucks by buying directly from a bulk tape supplier. C.S. 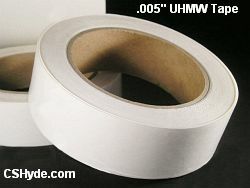 Hyde Company, CSHyde.com, (800) 461-4161, sells 6″-wide, flexible Teflon-coated and UHMW tapes that work great, with either rubber, silicone, or acrylic adhesives. The price works out to about $1 per rifle. MiKe Ratigan recommends the “Skived” (blade sliced) PTFE Teflon .005″ tape with silicone adhesive, item 15-5S. This is very low-friction and highly conformable, so it bends easily around your stock contours. You’ll need to call for custom 5″ or 6″ widths, and expect to pay about $50 for a 5-yard-long (180″) roll. Share the post "Teflon Benchrest Stock Tape Sources"